Do you have a “green thumb” but still need to charge your phone multiple times a day? One of the more exciting developments in phone charging is Arkyne Technologies’ Bioo Lite, a charger that turns your houseplant into an honest-to-goodness phone-charging station. Harnessing the power of photosynthesis, the pot comes with a USB port providing 3.5 volts of power. That’s just a little less than the amount of power that comes from a computer’s USB port. Of course, not all plants provide the same amount of electricity, and Bioo doesn’t work at all if your plant dies, so those with a reputation of accidentally killing houseplants may want to look elsewhere. Still, Bioo Lite represents a new frontier in energy. It’s available on Indiegogo for a little over $100, though the first shipments aren’t scheduled to go out until December 2016. Ever find yourself unable to make it to a charging station while waiting for that all-important phone call or email? Of course you have; it’s one of the lowlights of living in the modern world. Next time, take your charging station with you with Firebox’s PulsePak Emergency Charger. Small enough to go around on your keyring, the PulsePak contains a tiny external battery that can give your phone that necessary two-hour charge. Available now for under $20, the PulsePak charges all Micro-USB Devices and all iPhones 5 and newer. Or maybe you’d rather “go big” with your phone charger, with something that reflects your mood or offers a smile. Enter Firebox’s Emoji Chargers, which keep you powered up with some of the world’s most popular emojis: unicorn, eggplant, silly ghost, poop, or tears of joy. Did we mention that these $50 chargers’ powerful 2600mAh batteries are sure to get you to 100 percent? Never mind—either you can’t live another day without them or you’ve already moved on. iAnko’s Bubble Wrap iPhone case for iPhone 5 and 5s, is perfect for those with a history of dropping their phone, or just a weakness for popping bubble wrap. Best of all, the bubbles pop right back up. It’s cheap, too, at $10. Another case designed to whisk you back to childhood, the YiMoo Swimming Fish case contains liquid and two fish that swish around in their clear case. No fish food required, this case is available for iPhone 5 and 5s starting at $10. Stay off the grass? Get out of here! 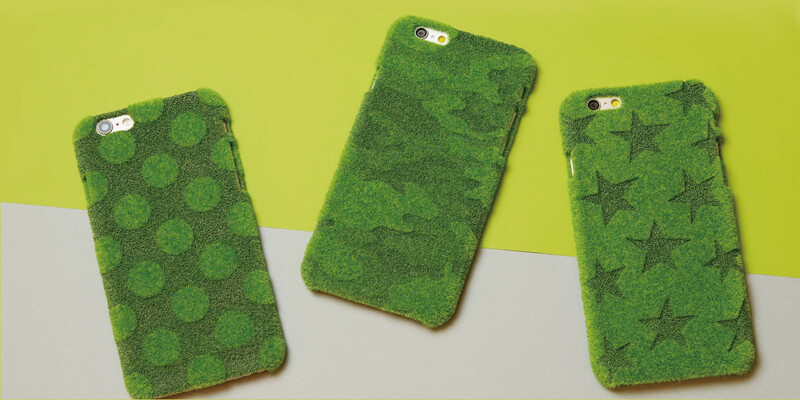 This $50 iPhone 6 case from Japan’s Shibaful (pictured above) is “a park in your hands.” The grass is actually made of nylon—probably a good thing since watering one’s phone is a bad idea. Still, the case’s texture is deeply satisfying and easy on the eyes. 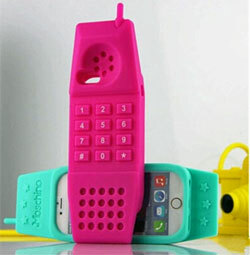 For those ready to go the nostalgia route, there’s the Moschino Vintage Mobile Phone Case, which turns your little self-contained iPhone 6 into a 1980s rubber behemoth. 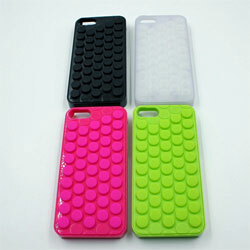 Available for a cool $7 in purple, red, pink, yellow, and teal, this case is actually a smart buy for those who want extra protection and a better grip. Good luck getting it into your pocket, though. And there are other styles by Moschino worth trying out as well. 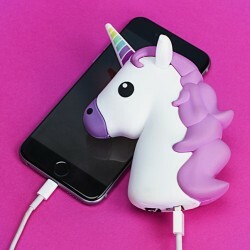 Even when you’re not making calls, your smartphone can express your personality with one of these fun cases and chargers.